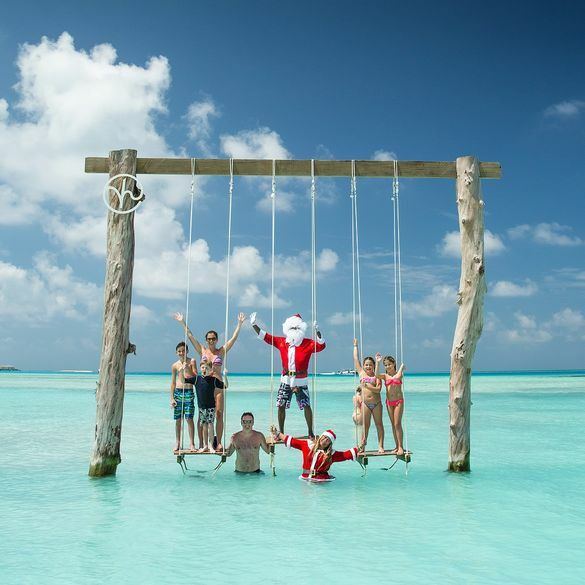 With an extended winter holiday on the way for UK travellers and temperatures still exceeding 30 degrees in the Maldives, it appears even Santa is taking a break this Christmas and heading to the Maldives for some fabulously festive fun. Christmas events in the Maldives this year include a feast and firework show at Anantara’s resorts, a four-day festive football camp for younger guests at Amilla Fushi and a cocktail and barefoot BBQ party at Kandima Maldives. Resorts in the Maldives are also set to welcome 2019 in style, with an exclusive performance from pop icon Rita Ora taking place at Amilla Fushi on New Year’s Eve and a Full Moon Festive Party planned for Anantara’s own desert island. Anantara’s resorts of Anantara Dhigu, Anantara Veli and Naladhu Private Island will invite guests of all ages to enjoy an exciting schedule of events this Christmas, including a spectacular firework show and a traditional festive feast. Anantara’s culinary line up this winter will showcase traditional Maldivian, Thai and Japanese cuisines and Santa himself will also be visiting the lagoon, leading jet-ski excursions, diving expeditions, and underwater present hunts. For New Year’s Eve, each resort will be transformed with a different festive theme: Anantara Dhigu will take inspiration from Alice in Wonderland, Anantara Veli will feature a masquerade theme with an adults-only ball, and Naladhu Private Island Maldives will celebrate the New Year with a sophisticated Caviar & Pearls motif. Those wishing to dance the night away can also enjoy the Full Moon Festive Party at Anantara’s desert island of Gulhifushi. Accommodation on a bed and breakfast basis during the festive break starts from £533 ($685) per room, per night at Anantara Dhigu; from £735 ($944) per room, per night at Anantara Veli; and from £1,235 ($1,587) per room, per night at Naladhu Private Island. For more information, visit www.anantara.com. The luxury resorts of Amilla Fushi, Finolhu and Huvafen Fushi have planned a festive season full of memorable moments this winter. Alongside an exclusive performance from pop icon Rita Ora on New Year’s Eve, offerings at Amilla Fushi during the winter break will include a world-class spectacle from the UK-based pyro performance group, The Fuel Girls; music from Irish singer, songwriter and lead singer of B*witched, Edele Lynch; and a four-day football training camp for younger guests from Australian football hero Tim Cahill. Santa will arrive on jet-ski to Finolhu and the island resort will also offer music from the Gypsy Queens and The Riffs, plus dazzling performances by Area 51 acrobats. Fans of the Great Gatsby should head to Huvafen Fushi this New Year’s Eve, when the resort will transform into a glamourous Gatsby Mansion. Accommodation during the festive break starts from £854 ($1,100) per room, per night at Finolhu (staying in a Lagoon Villa including daily breakfast); from at £1,553 ($2,000) per room per night at Amilla Fushi (staying in an Ocean Reef House including daily breakfast); and from £2,562 ($3,300) per room per night at Huvafen Fushi (based on two adults sharing a Beach Bungalow with pool including breakfast). For further information, visit www.finolhu.com, www.amilla.mv or www.huvafenfushi.com. The playful resort of Kandima Maldives will offer guests a festive-blend of delicious cuisine, stylish cocktails and fun entertainment this festive season, including music from The Tigers and the UK’s Eurovision 2017 singer, Holly Brewer. On 22nd December, Kandima Maldives will host a tree lighting ceremony on the beach, followed by a cocktail party, barefoot BBQ and live music from Maldivian band The Shiuz. Following a Christmas Eve TropiKal Cocktail Party on the beach, guests will be visited by Father Christmas and treated to a four-course set menu on Christmas Day, featuring prime meat cuts and freshly caught seafood. The resort will also invite 15 local Maldivian artists to the island on 28th December to showcase their artistic talent during the KULA Art Festival. Room rates at Kandima Maldives over the festive break start from £303 per night, on a half-board basis in a Sky Studio. For more information, visit www.kandima.com. For further information on the Maldives, visitwww.visitmaldives.com. Image 1: Santa at Anantara Veli in the Maldives. Image 2: Father Christmas at Kandima Maldives. Image 3: Santa arriving on jet ski in the Maldives.